Ever notice how many Old Testament couples met at a well? Abraham’s servant met Rebecca at a well on behalf of Isaac. A young shepherdess simply going about her business, being her sweet self to the stranger and his camels and voila! She gets a ring and an all-expense paid trip to meet her beloved. A generation later, Rachel was a sight for sore eyes when Jacob gazed upon her fine form strolling over the hill to water her sheep at a well. In a sudden burst of manliness, he herculesed a large stone that was covering the well, watered her sheep, and then planted a kiss on her like a hero that saved the day. And last but not least, the one and only Moses came to Zipporah’s rescue when some overbearing shepherds were trying to intimidate her and her sisters at a well. Their father insisted on meeting the man who stood up to the aggressors and then offered his daughter’s hand in marriage. Apparently, people’s marriageable qualities tend to surface at wells. All of this well-matchmaking makes sense, for where else are you most likely to run into people in Bible times in the desert? 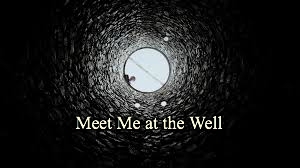 A well was a place of gathering, a life-giving source that people had to work into their daily schedules. Sadly, I can’t think of a comparable modern equivalent. Water comes in pipes and life is more hurried. When simple necessities come easy, things that take time feel bothersome, and we’re left without natural built-in breaks to slow and contemplate or even maybe get to know the stranger next to us. If you’re like me, then hearing stories about chance interactions and happy endings can sometimes leave you feeling dejected and almost willing to give up your smart phone and modern plumbing to trade for a simpler time. Perhaps you’ve risked your heart one too many times and are just plain weary of singleness, heartache, and the daily grind without companionship. I don’t have an antidote for singleness. I don’t have a cure for the desire for marriage and a family. I do, however know one more story about another pair that met at a well. At the well, her maternal ancestors found love and matrimony. She found a different kind of groom. She found the Messiah, Jesus. “Sir give me this water so that I will not be thirsty or have to come here to draw water!” You who are familiar with well-beaten paths and the daily grind: listen to her plea when she recognizes that natural means aren’t enough and drinks deeply from the living water offered by her Savior. We all have access to that well. Won’t you meet me there? It’s where your Savior will interrupt, remind, and satisfy. You will fill your jar and leave in peace.